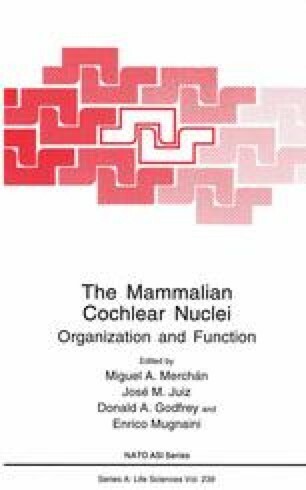 The cochlear nucleus is the target of a greater concentration of descending projections than any other auditory structure, including the cochlea (Rasmussen,’ 64; Cant and Morest,’ 78; Spangler and Warr,’ 91). In contrast to the rest of the central auditory system, parts of the cochlear nucleus may receive more descending afférents than ascending afferents (Kane and Conlee,’ 79; Conlee and Kane,’ 82; Spangler et al.,’ 87). Despite their unusual numbers and potential importance, the descending inputs to the cochlear nucleus have received limited attention. Consequently, we have an equally limited understanding of the contribution of descending projections to the functional integrity of the cochlear nucleus. General stimulation of the descending fibers has broad inhibitory effects upon unit activity, although some facilitory effects have also been reported (Pfalz,’ 62; Comis and Whitfield,’ 68; Starr and Wernick,’ 68; Comis and Davies,’ 69; Comis,’ 70; Mast,’ 70; Bourk,’ 76; Brown and Buchwald,’ 76; Caspary,’ 86). Pickles and Comis (’73) and Pickles (’76) have argued that descending input may enhance signal detection in noise by influencing critical bandwidth, but this concept has not been developed. Others have suggested an influence of descending input on the effective encoding of complex signals (Frisina et al.,’ 90; Shore et al.,’ 91). Still other proposed roles of the descending auditory pathways, such as loudness protection, might be expected to function at the level of the cochlea rather than at the level of the cochlear nucleus (Cody and Johnstone,’ 82; Liberman,’ 88).